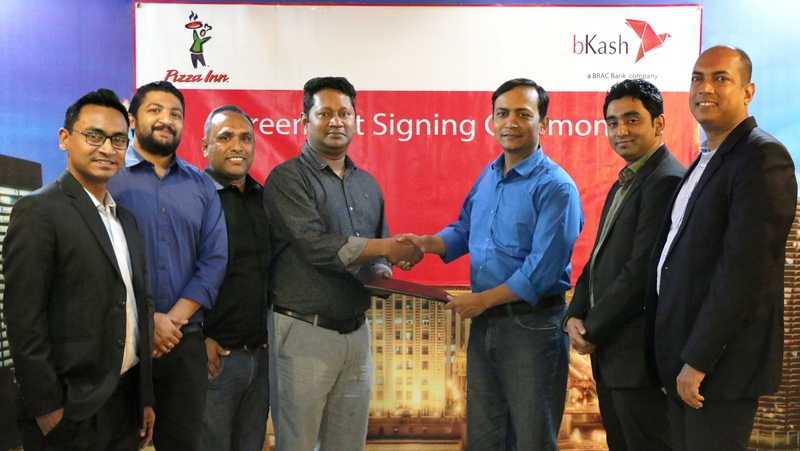 Enabling customers to make payment via bKash at all Pizza Inn outlets, Mizanur Rashid, Chief Commercial Officer of bKash and Major Mohammad Ashfaque Hossain (Retd. ), General Manager, Pizza Inn exchanged an agreement at Pizza Inn office recently. Among others, Mahbub Sobhan, Head of M-Commerce, Sirajul Mowla, Manager, Ahasanul Kabir, Channel Manager of bKash and Resal Rajib Huda, Accounts in Charge, Sabbir Newaz, Manager Marketing and Brand Development from Pizza Inn were present during the occasion.